Sometime we need to extract few characters of a string with the help of Left function. In this guide we have to discuss how to use Left function with Find function to extract the worlds. Excel allows you to use a user defined function to split a text string as per your need. 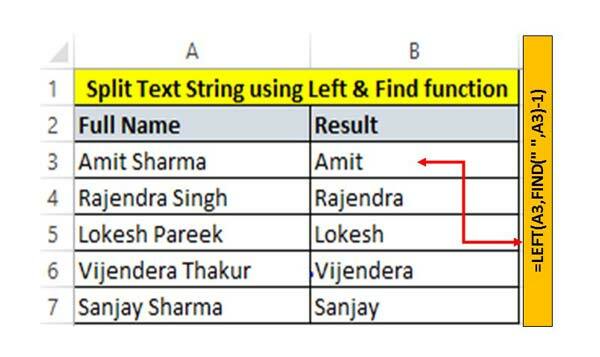 To quickly split text string at specific character then you must have to know how to use Left function with Find function. During working on text string sometime you must have to separate the first and last name. To split any text string in different columns you must have to know which function you must have to use in the situation. This article helps you to use more than one text category function to resolve your issue. Before get the solution of your query first you must have to know about the Left function and Find function in Excel. Find_text: This is an required argument. You have to type the text which you want to find. Within_text: It is another required argument which containing the text you want to find. Start_num: It is an option argument which specify the the starting position for searching the text. It is one of the most important function which is used in the Text category in Microsoft Excel. LEFT function is used to extract amount of char(s) of start from the string of text. Text: It is the text string that has number of characters in which you want to extract. num_chars: It specifies the number of characters you want to extract from left most side. Step 1: First you must have to type few team members name in a column. In this guide we have put five team members full name from A3:A7 range. Step 2: Type the following given function in cell B3 =LEFT(A3,FIND(” “,A3)-1) and press enter. Now, drag the cell B3 formula to rest of the cells to get the result. Now, you can check given Left and find function extract few number of characters in your resulted cell.